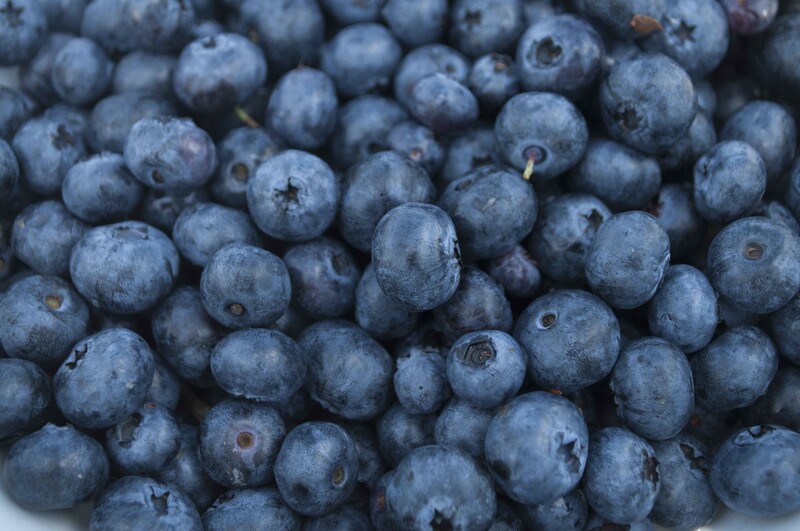 Blueberries are in peak season. I'll be honest: I'm not so into pancakes. As a vehicle for berries, butter and maple syrup, I'll accept them, but I'll opt for a plain bacon-and-egg breakfast every time.. But crêpes... Oh, crêpes. These fluffy, French-y little griddlecakes are more egg than flour, sinfully smooth and endlessly flexible — you can fold them around everything from fruits to fish for a meal that feels fancy (but isn't, really), any meal of the day. They've been a staple in my house on and off since college. 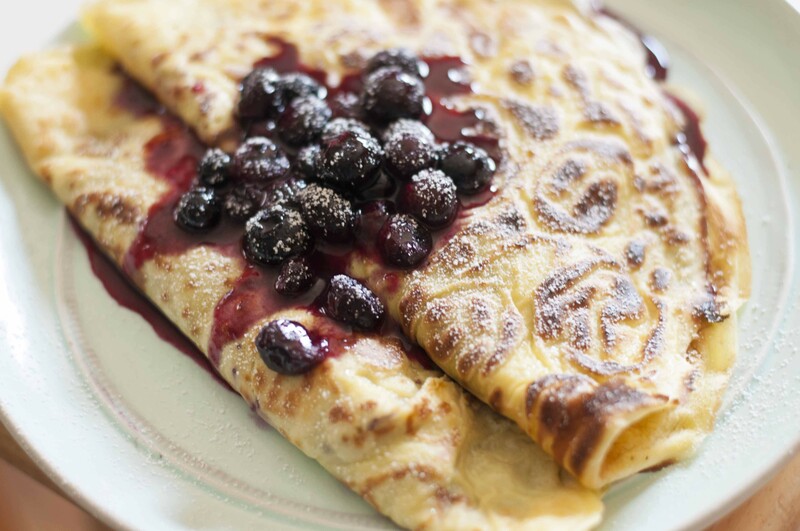 This summer, I've been wrapping berries — this week, blueberries from Super Acres Farm, in Lyme, N.H. (which is about 15 miles from my house and offers pick-your-own for $2.75 a pound) — into crêpes with winning results that have been too good not to share. With all the rain we've been having, the berries have been fruiting like crazy and, so far, 2015 has brought bountiful strawberries, black raspberries and blueberries, as the bushes soak up the water and convert it into fruit. In Chittenden County, pickers can head to Adam's Berry Farm or Charlotte Berry Farm (among others) for pick-your-own, or to Last Resort Farm in Addison County. I froze much of my last 10-pound pick, but saved the rest for snacking and crêpes — because the summer is short and why not pretend we're fancy? Sift together flour, salt, baking powder and sugar, then re-sift into a large bowl. Beat eggs in a medium bowl. Add water and buttermilk and beat again until all are well combined. Blend the liquid ingredients into the powdered ones for just a moment until they are just mixed but still a little clumpy. Heat a 9-inch pan or skillet over medium heat. Melt a thin pat of butter into the pan until it begins to brown. Using a measuring cup as a scoop, pour just less than half a cup of the batter into the pan and swirl it around until it coats most of the bottom of the pan. Cook the crêpe until it sets, then flip to brown the other side. Repeat until you're out of batter, re-buttering the pan between each one. Stack the cakes on a plate, cover with a cloth and set aside. When you're done making the crêpes, melt two or three tablespoons of butter into the same pan until it begins to brown. Add a similar amount of maple syrup, then the berries. Cook over medium heat, stirring often but not constantly, until the berries puff up and begin to release their juices, about 2 minutes. Remove from heat immediately before they disintegrate! Pull a single crêpe off the stack. Place it flat on a plate, then spoon on a few tablespoons (or as much as you like!) of the blueberry mixture. Fold or roll the crêpe and repeat. Top with a spoonful of berries and powdered sugar for garnish and serve post-haste.